The BBC has uncovered new video evidence that US forces may have been responsible for the deliberate killing of 11 innocent Iraqi civilians. The video appears to challenge the US military's account of events that took place in the town of Ishaqi in March. The US said at the time four people died during a military operation, but Iraqi police claimed that US troops had deliberately shot the 11 people. A spokesman for US forces in Iraq told the BBC an inquiry was under way. The new evidence comes in the wake of the alleged massacre in Haditha, where US marines are suspected of killing up to 24 Iraqi civilians in November 2005 and covering up the deaths. The incident is being investigated by the Pentagon. The US military has announced that coalition troops in Iraq are to have ethical training following the furore surrounding the alleged killings. For the next 30 days, they would receive lessons in "core warrior values", a military statement said. The news of ethical training for US-led troops is likely to be greeted with cynicism by many Iraqis, the BBC's Ian Pannell in Baghdad says, as the troops have long been accused of deliberately targeting civilians. 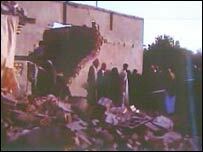 The video pictures obtained by the BBC appear to contradict the US account of the events in Ishaqi, about 100km (60 miles) north of Baghdad, on 15 March 2006. The US authorities said they were involved in a firefight after a tip-off that an al-Qaeda supporter was visiting the house. According to the Americans, the building collapsed under heavy fire killing four people - a suspect, two women and a child. But a report filed by Iraqi police accused US troops of rounding up and deliberately shooting 11 people in the house, including five children and four women, before blowing up the building. The video tape obtained by the BBC shows a number of dead adults and children at the site with what our world affairs editor John Simpson says were clearly gunshot wounds. The pictures came from a hardline Sunni group opposed to coalition forces. It has been cross-checked with other images taken at the time of events and is believed to be genuine, the BBC's Ian Pannell in Baghdad says.